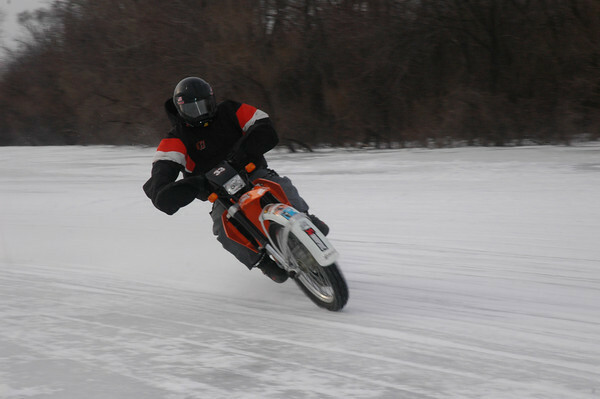 So I have to thank Diesel Joe for getting me started on this ice riding gig and he was an early proponent of using Rock Central “Canadian” ice tires. 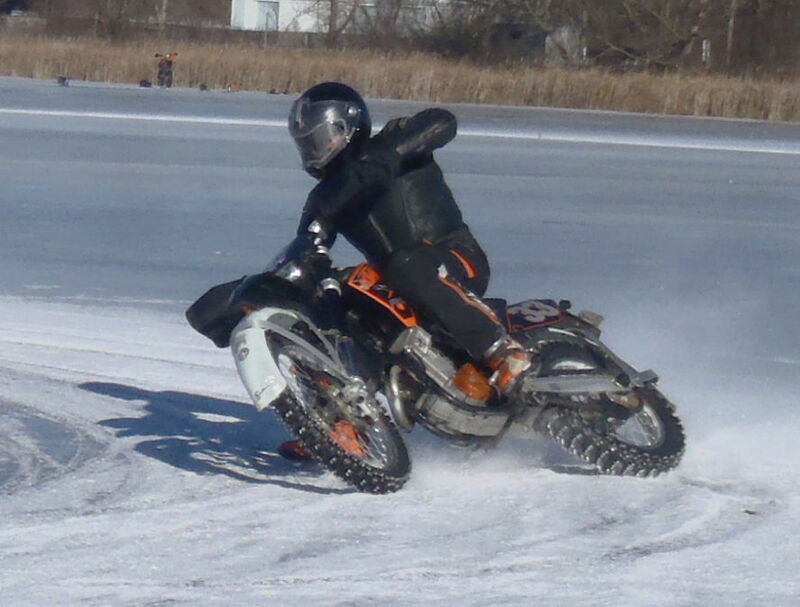 So when I started riding on the ice I tried Fredette AMA legal tires first and then bought a set of Rock Central’s from my buddy Dennis (you don’t want to know why he was selling them – not a good experience). Now I’ve been on Canadians for six years and there’s no going back for me. 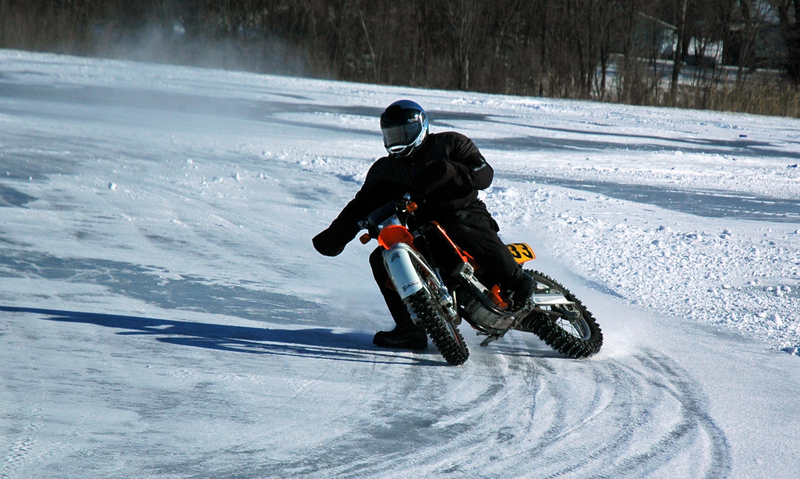 A lot of ice riders call the Canadian’s “cheater tires” because they hook up so well in the “fluff” on the apron of the track and you can ride an outside line that the AMA tire guys struggle with. The better hook-up is because of a longer screw head and a more open tire pattern, more of a knobby. Whether one style is faster than another is open for debate. With Canadian’s you don’t use the brakes much and you pitch and slide the bike into the corner, scrubbing off speed. 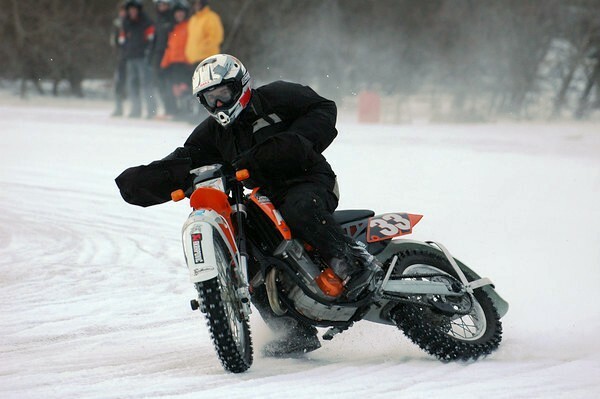 With AMA tires you have much more stability on the brakes and you front brake much harder into the corner, then drive around the corner. I find that it’s easy for a good rider on Fredettes to take an inside line and beat me through the corners. It makes for interesting corner exits – watch the video below. Wayne learning to trust the tires...and not use the brakes! If you’re on a fast, wide open track with lots of sweeping corners the Canadians can be a definite advantage. Especially if you’re riding a bike with a lot of power. The Canadian tires are significantly heavier and require more power to turn the mass and also to change direction in the corners due to rotating mass. Wayne after a little more practice...this is fun stuff! On a tight track with a lot of switch-backs the AMA tires can usually out-perform the Canadians. You’re not wasting all that time sliding into the corners and riding the outside line. Fredette’s will allow you to brake much harder into the corner and hold a tight inside line. To see the Rock Central Canadian tires is full video action click the You-Tube link below. Diesel Joe mounted up his new HD Go Pro camera on his helmet and chased Wayne around the track and got some nice footage of the “Canadian style” of riding. 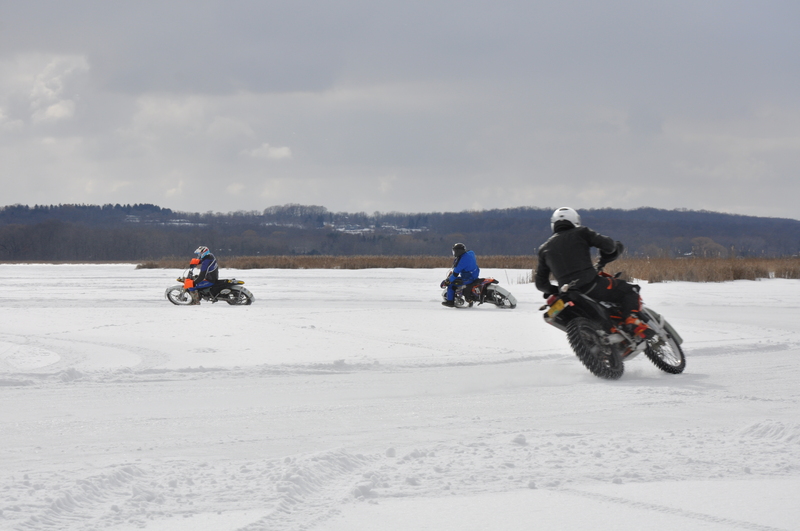 Not that we’re any pro’s at this…we’re just out having some fun and checking out the differences between the Canadian tires and AMA legal tires like Fredette’s. Diesel Joe is riding a KTM 400 XCW with Fredette tires and you can see the different lines he takes as compared to me. There’s a couple of times where he had to resist taking the inside line and blowing by me for the sake of the video! 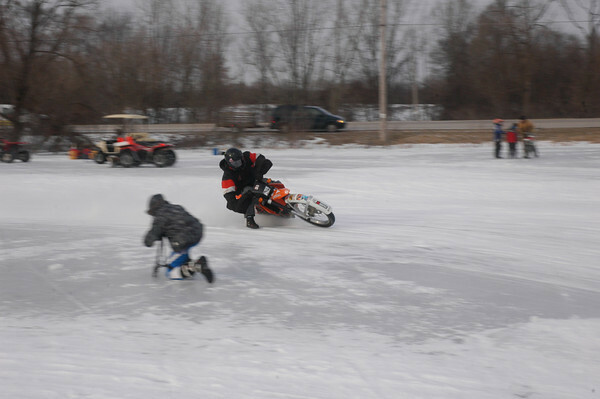 Wayne & Swiss Joe dicing it up on the ice! 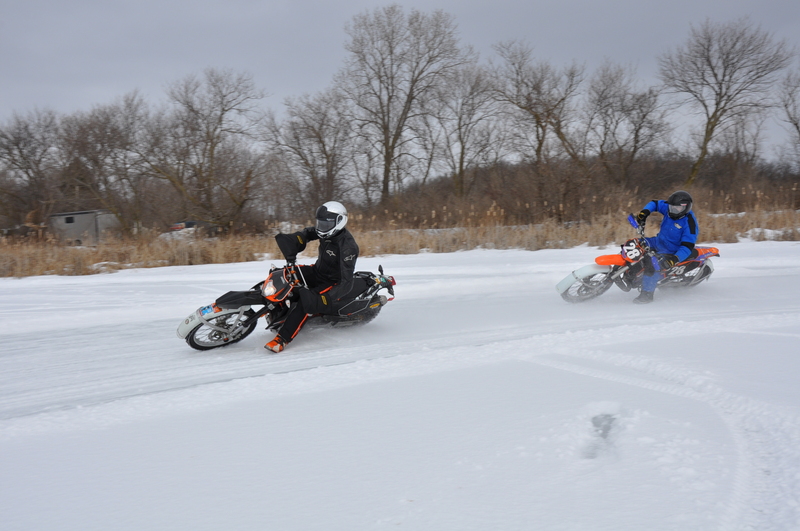 The ice has been pretty good this winter and we’ve been lucky enough to get out and ride most weekends. I had a bit of a rough start with the 690 Enduro (see previous post) but now with a new front tire the bike is sorted out pretty well. This past week we got a good group of riders together and it was the first real test with the bigger bike. I was anxious to see how it would work out and if I could keep pace with the fast riders. The previous week I played “bike bum” and rode everyone else’s bikes with Fredette tires and I enjoyed the practice but just couldn’t get up to pace. Now I was on my bike with Rock Central Canadian tires that I’m accustomed to and it made the difference! Most of the day I was able to hang in there and run the pace until I got tired from working extra hard in the tight corners and switch-backs. The extra weight and gyro effect of the big 690 motor made it a workout in the tight sections but it was a blast on the fast, sweeping back section of our track. There were some cool, high-speed, outside passes made there! 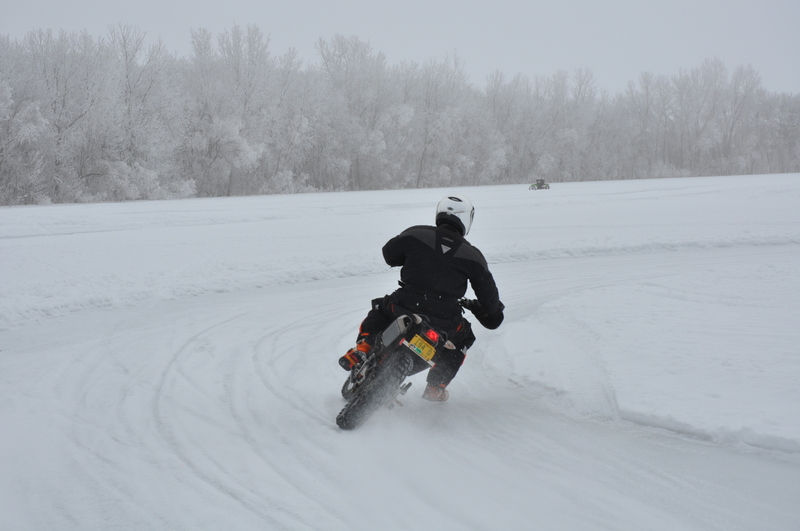 We originally plowed about a mile long, fairly tight track with lots of corners and switch-backs. About mid-day I decided I needed to build a track more suited to my strengths so I added another mile of more open, sweeping sections and that worked to my advantage. I was able to open up some of the power advantage of the 690 bike in that section only to have the smaller, lighter bikes back on my tail in the tight stuff. Of course some decreasing radius turns kept everybody on their toes! All in all I have to say that the 690 Enduro R has been an awesome all around bike. I’ve done a lot of dual sport riding this past summer, road trips to Indy and daily commuting to work, off-road woods riding and super moto on the back roads of Wisconsin and the bike has performed flawlessly. Now with the ice riding I have capped off a great year on the bike and it has handled everything I’ve thrown at it. This is by far the most versatile bike I know of and it’s been a blast doing it all. But, as with all good things, it must come to an end. This has been my “demo” bike and demo bikes are always for sale. Now that I’ve sorted it all out, I have it sold, and I’m sure the new owner will love it as much as I have.